Hey guys! It’s Lauren visiting from Tastes Better From Scratch and I’m really excited to share one of my all time favorite breakfasts with you today–German Pancakes! My mom made these all the time growing up and we all absolutely love them! 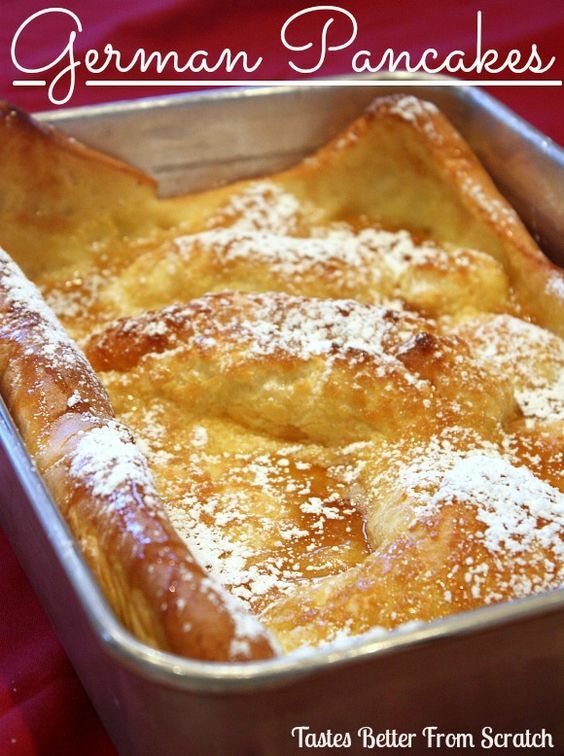 I love how they puff up in the pan when they bake and I love eating them with powdered sugar and syrup drizzled on top! YUM! The best part about them is they only take about 5 seconds to prepare (you just throw everything in the blender) and the ingredients are items you typically have on hand or are cheap to purchase! I would also add that these are perfect to make when you have company over, because of how quick and easy they are – and they will totally feed a crowd! Preheat oven to 425 degrees F. As oven preheats, place the butter in 9x13'' baking dish and put in oven for the butter to melt. Place the eggs, milk, flour, salt and vanilla in a blender; cover and process until smooth. Pour batter into the baking dish with the melted butter. Bake, for 20 minutes or until golden brown and puffy. 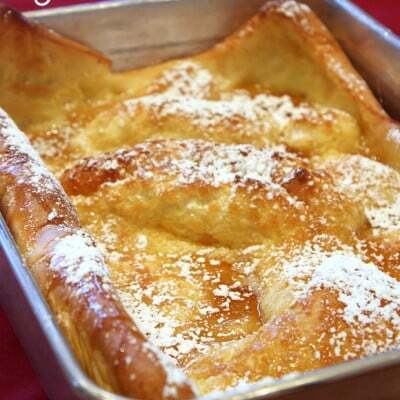 Remove from oven and sprinkle generously with syrup and powdered sugar or fresh lemon juice and powdered sugar. 0 Response to "GERMAN PANCAKES"